The vision of Clarence Church of Christ is to be a congregation of fully committed disciples of Christ that go out and call others to be fully committed disciples of Christ. We understand disciples to be people who live according to the following values: relate, learn, and serve. Relate: Fellowship with Christ and other believers. Learn: Be a student of Christ and his Word. Serve: Serve all people in the love of Christ and out of the power of his Spirit. Out of these three values, disciples bear witness that the good news (the gospel) of Christ is reaching into the world to redeem it from sin. Devotion to the cause of Christian unity — aiming to discuss and discern truth with each other on the basis of the Scriptures, under the Guidance of the Spirit of Christ. Looking to the Bible (with specific focus on the New Testament scriptures) as our authoritative guide for truth and direction. Sharing in the remembrance and communion of our Lord by taking his meal (the bread and the cup) with other believers on the first day of every week, as was the custom of the early church as noted in the New Testament. Preaching that centers on the word of Christ and Him crucified, and calls people to make Jesus the Lord of every aspect of their life. A longing for all persons of all races and all places to realize that they are created in the goodness of the image of God and are in need of the saving grace of Christ Jesus. An expectation that God’s love for all people, and our gracious response to that love, will: (1) compel us to have sincere, devoted, and heartfelt worship; and (2) compel us to harmoniously work with each other within our community and world -- to make the good news of God’s love known and experienced by all. Recognizing that we are not the only Christians, but striving to be Christians only (recognizing that we are one local manifestation of Christ's church on earth). Our understanding of membership in the church is based on the following standards given in the New Testament. A person is considered a member, if they are part of the universal body of Christ. A person becomes part of the universal body of Christ by belief, that is, repenting of one's sin and faithfully committing one's entire life to Christ. We understand the New Testament to say that this commitment of lifelong faith ideally begins at one’s baptism (whole body immersion in water). A member of the universal body of Christ is expected to commit to a local body of believers in regard to: leadership, discipline, fellowship, giving, and service. In 1834, Clarence Church of Christ was the result of an initiative taken by Alexander Campbell, a leader of what is known as the American Restoration Movement, to form a new congregation of Christians in western New York. The Restoration Movement sought to renew existing churches, and form new churches according to the patterns and principles given in the New Testament. The movement sought to emphasize the New Testament as the weightiest authority for followers of Jesus, that is, that all other sayings or writings about Jesus and the church are subject to the content of the New Testament. The first congregation was known as the First Congregation of Disciples of Christ, and the first meetinghouse was a small stone structure built in 1844, which is the current site of the Clarence Historical Society. In 1876, the congregation built a larger church building, which they built on Main Street in the Clarence Hollow. Around the decades, 1950-70, the congregation distanced itself from the Disciples of Christ vein of the American Restoration Movement. This distancing resulted from the establishment of a Disciples of Christ denominational structure and management of buildings and resources, which was a departure from what many held as one of the foundational values of the movement: autonomous leadership and management of each local body of Christ. Eventually, the congregation in Clarence formally broke ties with the Disciples of Christ identity and continued as an independent congregation under the simple church of Christ identity. In 1970, the current building on Old Goodrich Road was completed on donated land. Most recently in 2004, a Family Life Center was added, which included a gymnasium with stage, commercial kitchen, dining room, and meeting/classrooms. The congregation has been lead by the preaching and teaching of 39 men up to the present time. 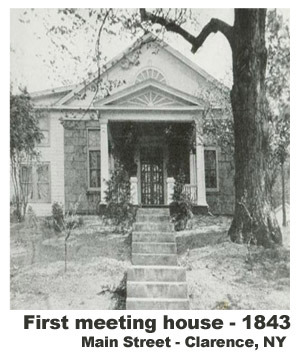 The Clarence Church of Christ was founded in 1834 as a result of a direct appeal by Alexander Campbell, a leader of the Restoration Movement. This Movement sought to renew the Christian Church on the pattern set forth in the New Testament without regard to creeds which they believed kept Christianity divided. Asa Ransom, Jr., son of the first resident of Clarence, was one of the men inspired by Campbell's appeal to found the congregation. Ransom was designated a Trustee when the Legal Notice of Organization was filed in the Erie County Court, in Buffalo, in 1842 as The First Congregation of Disciples of Christ, Clarence. The first "Meeting House" was a small stone structure built in 1844, which is the current site of the Clarence Historical Society. The first Minister was J. J. Brown, followed by 38 men up to the present. In 1876, the congregation built a larger brick church building which they built on Main street in the Clarence Hollow. Formally severing its ties with the Disciples of Christ in 1950, the congregation then became known as the Clarence Church of Christ. In 1970, the current building on Old Goodrich Road was completed on land donated by the Paul Neff family. Most recently in 2004, a Family Life Center was added, which included a gymnasium with stage, commercial kitchen, dining room, and meeting/classrooms. You can learn more about Mike here. You can learn more about Jordan here.